This page contains infomation about previous public events hosted by the JHI in the academic year of 2013-2014. The Lancashire Science Festival is free to all and features a whole host of exciting presentations, hands-on activities and exhibits! Hosted annually by the University of Central Lancashire (UCLan), this event is a must be for anyone interested in science. Next year’s theme is “Power Up!!!! !” And so we hope that you can join us as we Power Up for a 3 day celebration of Science, Technology, Engineering and Maths. Experience physics as never before through the power of rock and roll with Being 747; learn how to harness the power of your brain with UCLan Psychology experts; launch your imagination as we Power Up Up And Away; go digital and debate the use of drones and then recharge your batteries at Surgical Spirit: The Science of Cocktails! For 2014 we are also excited to welcome the Festival of the Spoken Nerd – see the power of sparkling wit meeting fascinating science in this comedy night for the insatiably sci-curious. The main programme will be free of charge and open to primary schools on Thursday 26 June, Secondary Schools and Colleges on Friday 27 June and culminating with a general public day on Saturday 28 June. Tickets for our evening acts; ‘The Festival of the Spoken Nerd’ and ‘Surgical Sprit: The Science of Cocktails’ will be on sale soon from the Lancashire Science Festival website, along with a schedule of events. In the mid-1960s, several theorists proposed a clever mechanism that would get around an embarrassing problem in physics. The highly successful theories developed described the experimental evidence very well – but only if all particles had no mass. Introducing masses broke the theories. The new mechanism also made a prediction,a s first pointed out by Peter Higgs; there should be a new particle, with some unusual properties. Unfortunately, theory did not say what mass it would have, and so what energy particle accelerator you needed to look for it. In Summer 2012, the hunt finally seemed to conclude, with the observation by ATLAS and a sister experiment CMS of a new particle with superficially the correct properties. The evidence that it was really the Higgs grew with more data, and Higgs and Englert were awarded the 2013 Nobel Prize in Physics for their theory. For the experiments, the studies continue to confirm if the particle is the one and only Higgs, or if it is evidence for bigger theories that can also explain mysteries like Dark Matter. Prof Roger Jones is Head of the Particle, Space and Accelerator Division of Lancaster University, and also head of the Lancaster group on the ATLAS experiment at the large Hadron Collider (LHC). He has worked on the construction, operation and analysis of ATLAS since 1996, and is in charge of its computing for the UK, with responsibilities worldwide. Prior to working at the LHC, he worked on the previous accelerator, the Large Electron Positron Collider (LEP), on the OPAL and ALEPH experiments, making important measurements of the electroweak interaction (which is also instrumental in powering the Sun) and the strong interaction (which hold nuclei and most particles together, and is the origin of most of the mass of everyday objects). His PhD was on neutrino and antineutrino interactions, again making important measurements of the electroweak interaction. He studied at Christ Church Oxford and the University of Birmingham, and worked at Queen Mary University of London and CERN. His interests outside of work time are skiing, wine and Dr Who. 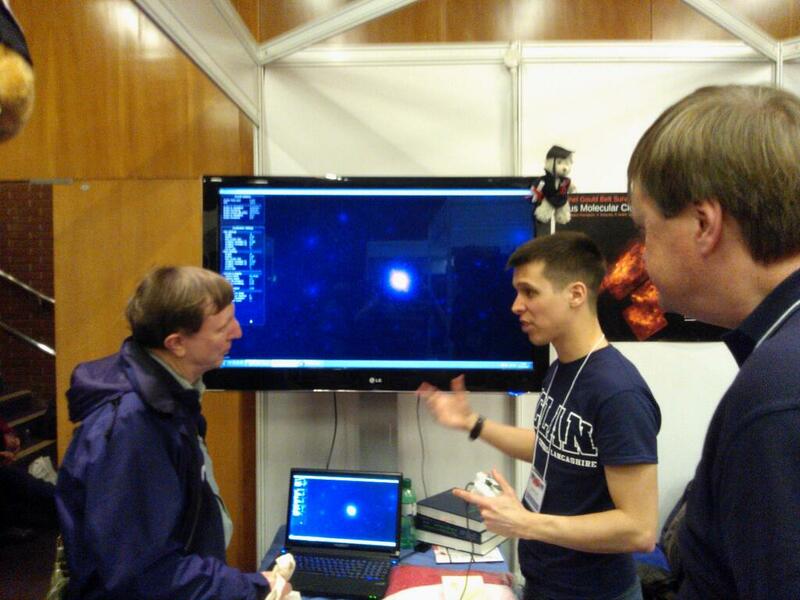 The JHI was represented once again this year at European Astrofest in Kensington, London. We had our usual stand – we have been at Astrofest every year since 1999. Our stand was packed with interactive displays and material, including: an astronomical quiz with prizes each day; simulated flights through distant galaxies; and many eager folk keen to discuss any matter relating to astronomy and to answer anyone’s questions. There were also UCLan text-books and other merchandise for sale. 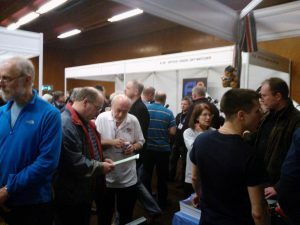 Many hundreds of delegates stopped by the stand to participate in one or more of the activities, or just to pass the time of day chatting about their favourite pastime – astronomy. 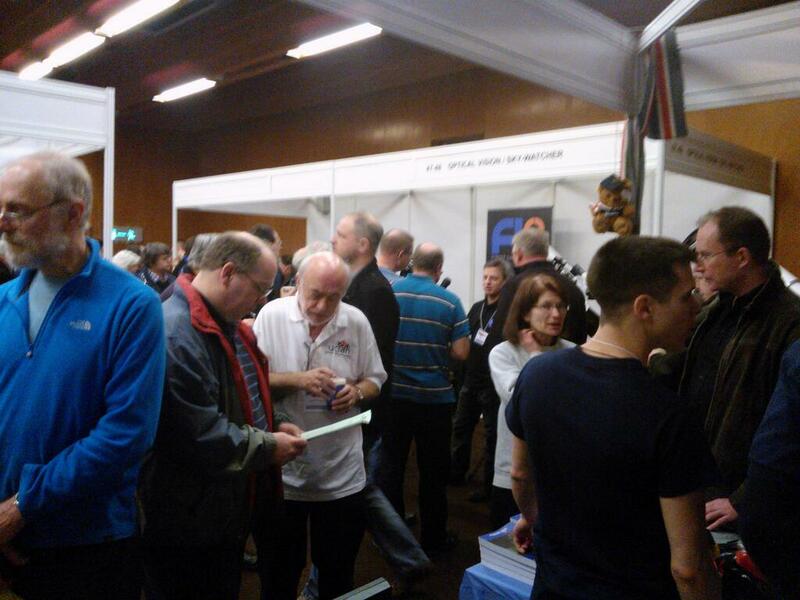 We look forward to welcoming people to next year’s Astrofest – we’ll be in our usual spot next-door to the coffee and sandwich bar. 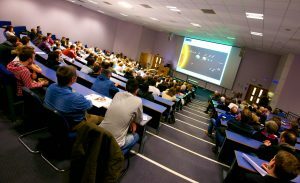 Join staff from the Jeremiah Horrocks Institute for Mathematics, Physics and Astronomy at the University of Central Lancashire, for an evening of Stargazing. Thursday 9th January 2014: General Public, 7-10pm. The evening will include an introductory talk followed by some amazing stargazing, or a planetarium show if the skies conspire against us and the clouds roll in! 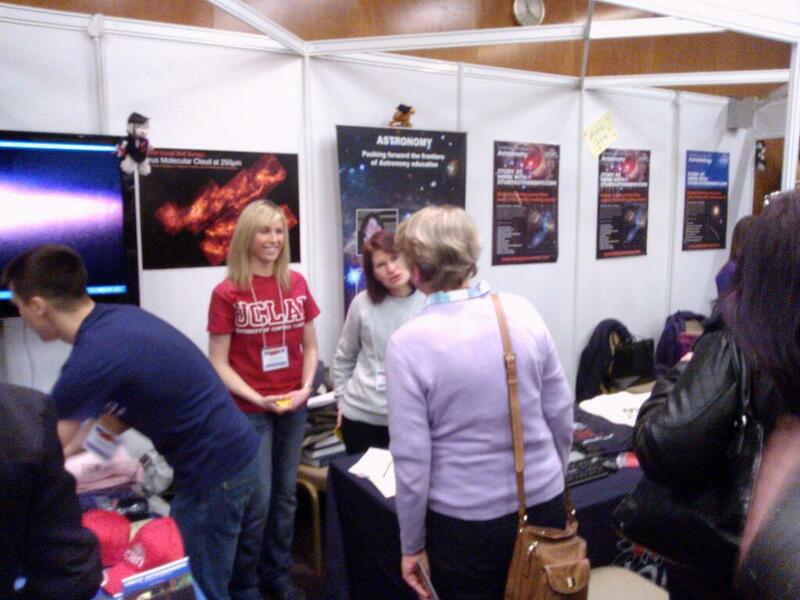 Plus, staff and research students from the Jeremiah Horrocks Institute will be there to answer any questions you have. Please wear warm clothing as you will be outside for the majority of the evening (weather permitting). Hot refreshments will be available throughout the evening. This event is suitable for any age group however all under 18s must be accompanied by an adult. Please email us with any special requirements. As part of the January 2014 program of events, the Sun At Night exhibition will be part of BBC’s Stargazing Live. The art installation condenses a year’s worth of data of the Sun into a single video, projected onto a large screen for members of the public to enjoy. 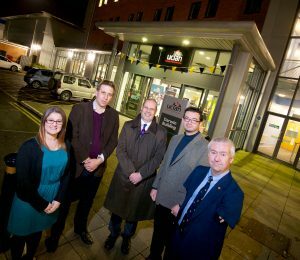 The exhibition has previously been displayed in Preston town center, allowing the public to experience some of the cutting edge solar physics research which takes place at the University of Central Lancashire. 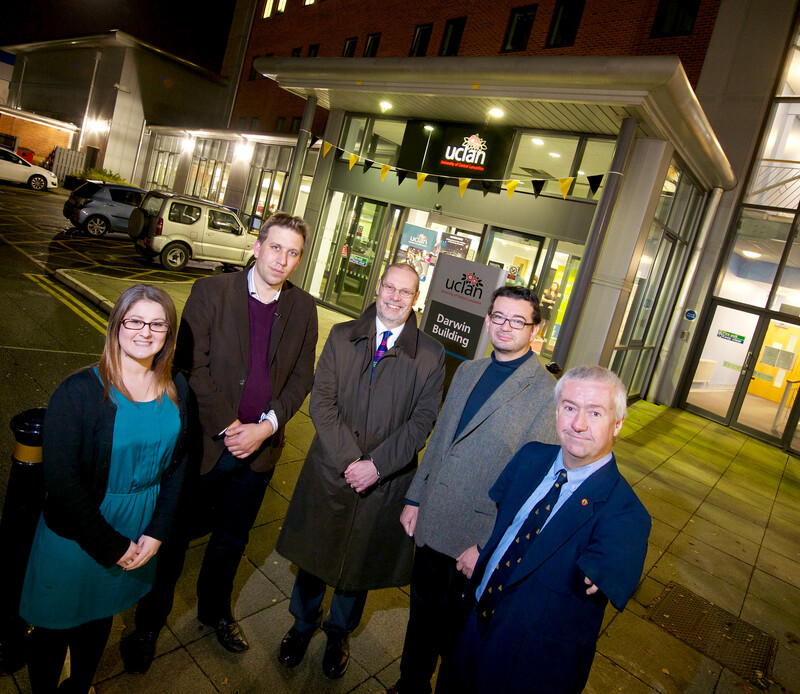 The project was funded by UCLan and Arts Council England, with several members of the Solar research group at the JHI contributing to the project realisation. 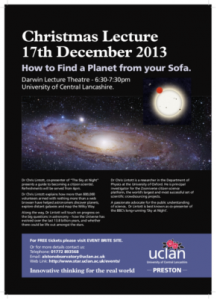 6.30 – 7.30pm, Darwin Lecture Theatre, Darwin Building, University of Central Lancashire. Dr Chris Lintott, co-presenter of “The Sky at Night” presents a guide to becoming a citizen scientist. Dr Chris Lintott explains how more than 800,000 volunteers armed with nothing more than a web browser have helped astronomers discover planets, explore distant galaxies and map the Milky Way. Along the way, Dr Lintott will touch on progress on the big questions in astronomy – how the Universe has evolved over the last 13.8 billion years, and whether there could be life out amongst the stars? 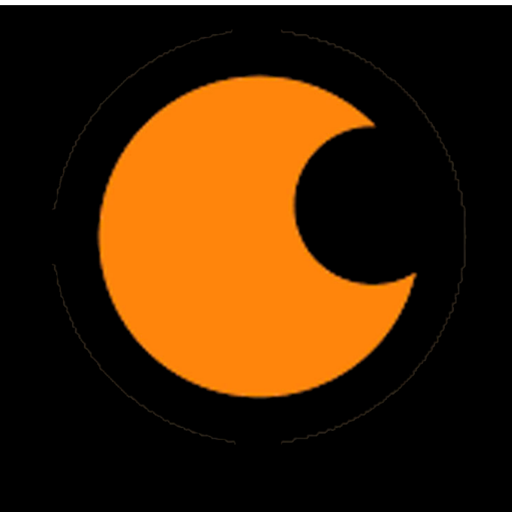 Dr Chris Lintott is a researcher in the Department of Physics at the University of Oxford. He is principal investigator for the Zooniverse citizen science platform, the world’s largest and most successful set of scientific crowd-sourcing projects. This event is FREE but reservations are required due to limited capacity. For any enquiries or to inform us of any special requirements, email alstonobservatory@uclan.ac.uk. The Sun at Night is a new Arts Council England and University of Central Lancashire funded installation by David Henckel and Dan Wilkinson that explores our relationship to the Sun and creatively disseminates the research of UCLan’s Solar Physics group utilising the stunning images taken by NASA’s Solar Dynamics Observatory. Over the course of 30th November to 1st December the covered market was transformed into the centre of our solar system with a large-scale public art installation. One year’s worth of footage of the Sun was condensed into a 30-minute film, which slowly rotated around a large cylindrical projection screen accompanied by an appropriately deep and sinister soundtrack. 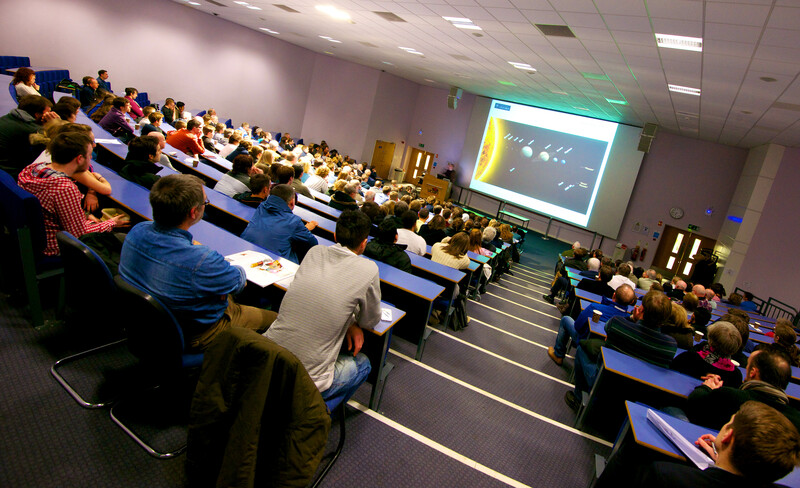 A contemporary equivalent to the public lectures of Preston astronomer Moses Holden, who used an orrery (model of the solar system) and magic lanterns to educate the public about our solar system, The Sun at Night allows the public to experience some of the cutting edge solar physics research which takes place at the University of Central Lancashire. The event included a talk about the Sun by Professor Robert William Walsh – Director of UCLan’s Research and Innovation Office, a talk about Moses Holden by local history detective Stephen Halliwell – an expert on the Preston Astronomer, and a live improvised performance at 8.00pm on Sunday night using analogue synthesisers and samplers / found sounds reacting to the footage. Playwright Eric Northey’s production The Transit of Venus, commemorating the 1642 observation of a transit of Venus by Jeremiah Horrocks and William Crabtree, will be performed at the St. Peter’s Arts Centre, Preston on 7th November. First performed in 2012, the year of the last transit of Venus observable from Earth to anyone yet alive, the play examines not only their discoveries but the religious and scientific tensions of the period, with England plunging into civil war and the foundations laid for what would become the modern scientific method. More information and tickets are available at the production’s home-page. 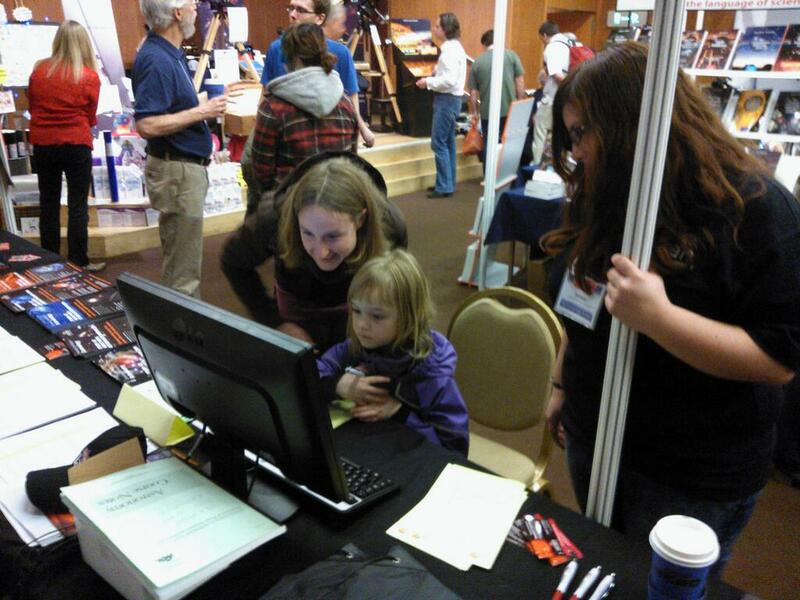 As part of the Harris Museum’s “Harris Flights” public art installation, academic members of the JHI and other constituent departments of the Computing, Engineering and Physical Sciences School have contributed SimUniverse, a state-of-the-art visulation project displaying large computer simulations of the universe, navigable with a standard games console controller. These simulations will be projected during the Harris Flights installation at the Harris Musuem and a number of different simulatios provided for users to explore. An example of the animation provided by SimUniverse is available at the JHI YouTube channel.